CHEF PAIRS SAN MIGUEL BEER WITH NEW CREATIONS July 20, 2011, Makati City – French cuisine and beer make a superb match. creaminess and slight salinity of the goat cheese. All three dishes were no doubt an exciting prelude to the two main courses of seafood and meat. The Snapper with Rosemary Butter was a welcome treat, especially when paired with San Miguel Premium All Malt. The citrusy hop noted on the perfectly balanced beer invigorated the succulence of the snapper fillet along with the velvet feel of the highly flavorful butter. For the meat main dish, Chef Karen prepared Lamb Navarin with Couscous. She paired this stewed lamb dish with hints of ginger, curry and dried apricots to match the San Miguel Super Dry, her choice of refreshment after a long day in the hot kitchen. “The quick and elegant finish of San Miguel Super Dry, as well as its moderate bitterness, rendered this spiced dish delightful for the palate, “she described. The dessert was also an affair to remember, Creme Chocolate, dark Belgian chocolate custard served with almond and coconut tuille. And who says desserts are only for coffee? Cerveza Negra proved to be a perfect companion for this sweet, creamy and frothy indulgence. “This is actually my second time to do beer pairing. The first was for a Portuguese beer where we focused on serving appetizers. The difference with taking part in this activity with the San Miguel Lifestyle Brews apart from myself being an avid consumer of San Miguel and a firm believer that San Miguel Beer is truly among the best beers in the world, there is this deeper sense of Filipino pride,” she adds. azine to be the number one free travel lifestyle magazine in the Philippines today. t airports in Manila, Cebu and Clark, in the different call centers in Metro Manila, several hotels, resorts and even in coffee shops around the city. ed the magazine last September! ), how can you go wrong in advertising with us? prior to leaving to avoid packing too much or too little. Write down all you intend to do to be more organized. Keep your cash hidden in different places just in case you lose something. Make sure you leave some room in your luggage for souvenirs or other purchases. Research about the place before traveling. It's best to be informed about weather conditions, local customs, hangouts, etc. Publisher’s Note “A journey of a thousand miles must begin with a single step.” – Lao Tzu With that in mind, we welcome you to our AugustSeptember Issue. Plan your trip, Explore a Philippine Destination Now. 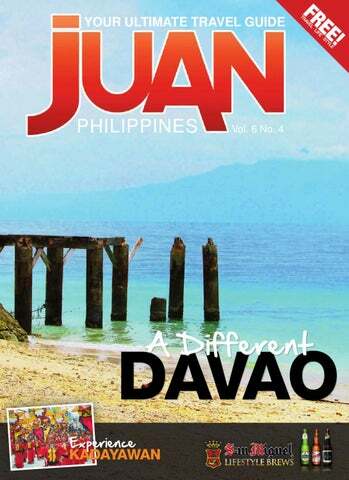 In this issue, Experience a different Davao, don’t forget to bring your digital cameras with you. Celebrate Kadayawan sa Dabaw with us. Join us for the festivities and marvel at our rich heritage. Be Equipped in traveling our country, check out the latest gadgets. Join our ! 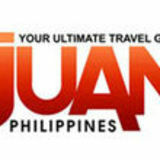 Like page by searching www.juanphilippines.com now! We would like to thank all of you who answered the call to “Be JUAN of us”. We really appreciate your comments and emails of support. Trust that every issue we make, we have you all in mind. We’re excited as we put out another issue of JUAN Philippines Magazine. We travel far and wide to bring you the best of the Philippines. With more than 7,107 islands, imagine the possibilities. Just Us And No other Philippines- Explore, Experience and Enjoy ! JUAN Philippines Magazine is charting another adventure. What are you waiting for? Let JUAN be Your Ultimate Travel Guide! Start Your Engines: Eating and Racing with Pit Lane Grub The brainchild of Jojo Alejandrino, Pit Lane grub geared itself up for a grand launch this year to serve food and motoring enthusiasts in its little pit stop over at Katipunan Avenue in Quezon City. With a whole mess of culinary offerings, from traditional American burgers and steaks to a festive Tex-Mex selection to light and fresh Japanese menu items, Pit Lane Grub can rev up your taste buds with an explosion of flavor, a variety of textures and a worthwhile experience. Highlighting their burgers, pastas and tacos, this motoring themed restaurant will have car and food enthusiasts racing to finish their signature item: The Nitro Burger. Featuring two half-pound patties made of certified Australian beef between potato buns, this towering behemoth is a monster truck of a burger designed to satisfy. They also have lighter offerings with delectable pasta dishes, light salad items and even dessert crepes to top of any meal. And to match up the food with even greater things, Pit Lane Crew also has also made a couple of successful events such as a live telecast of the football match between the Philippine Azkals Team versus Kuwait as well as a 4th of July Rockeoke. Pit Lane Grub started out as a food stall serving burgers at motorsports events such as the Circuit Showdown and the Lateral Drift Championship series. It was only a few months later that an opportunity to have their first stand-alone store presented itself. It was a race to the finish with one month to set up their Pit and to pimp out their menu with more than just burgers. JUAN's Feature This time around, we push back the layers of Davao City and its quick neighbor, the Island Garden City of Samal to discover an adventure that is satisfyingly filling for the active and energized as well as for the steady and relaxed. Culinary Cutaway Davao is peppered with buffet lunches and barbeque restaurants everywhere. And certainly, one of the best places to head out for is the Ranch and Reef restaurant. Quality and quantity plus some iced tea are included in their offerings. Their perfectly done US-certified roasts and wide array of unique desserts turn this quaint little surf and turf spot into overdrive, definitely one of the best in town. And with two branches, you know, this place is a Davao-must-try. A few steps away is another new sustenance source that is the Wild Safari Grill. For a tight budget and a large appetite, Safari stands to be the only buffet in town with bottomless bowls and glasses for ice cream, halo-halo and drinks. That is, if the grill station, featuring their signature Mongolian barbeque, doesn’t fill you up first. For some alternative dining choices, the Riverwalk Grill over at the Crocodile Park can and will definitely leave an indelible mark on your palate with their Exotic Menu. Probably the only place where you can chow down on Ostrich Steak, Crocodile Sisig and Stingray Stew while washing it all down with Dragonfruit Shake. Chilling in Davao is not a hard feat to do, especially in such coffee joints as Green Coffee. Proud to have the only air conditioned outdoor seating area, they serve drinks like Green Tea Freeziccinos and Strawberries and Cream that rival those from a certain doubletailed mermaid. And once armed with their Ensaymada or Choco Lava, anyone can collapse into their cozy interior and spend hours just relaxing. Maxima Aqua Fun and Canopy Tours. Known for the Abyss, a giant tarpaulin slide that shoots off riders up in the air and into the clear blue water, Maxima is the best place to go for outdoor and water activities. You can take in a canopy walk through the treetops or rappel down the side of the cliff. Just as easily, you can don a lifejacket and splash your way with kayaks, diving boards and snorkeling gears – enjoying all the resort’s amenities. Wind down the day in luxury; take in the best resort on the island to relax after a full day’s worth of activities. Take your last trip for the day and make a beeline for Bali Bali Beach Resort, a lush and extravagant end to a busy day. Indulge in this first class resort that prides itself with its exclusivity, luxury and also the gorgeous infinity pool that looks out into their gorgeous beach? A small resort with only a handful of villas will assure you that unwinding from a busy day is easily achievable if not downright guaranteed. Wake up the next day refreshed for another fun filled day of activities with the help of Wind and Wave Davao. Zip through the waters and relish the view of the Davao City skyline as you fly with Mindanao’s first and only parasail. Breeze between the mainland and the islands with their jet skis and crash the quiet shores of Talikud Beach for a sumptuous lunch. With a plethora of activities to choose from, Wind and Wave can fill up a day’s worth of activities from an introductory SCUBA dive (Diver’s Certificate not needed) to ATV trips to island hopping and a whole mess of things to do in and around Davao and Samal. This is only scratching the secondary surface of Davao. This patch of land that is the busiest and largest in Mindanao is a tourism, business and trade center in southern Philippines. Push back the museums, parks and shrines and experience an alternative Davao – one that is different, distinct and daring. backgrounds, and for topics for conversation and scholarly discourse. There are about 76 to 78 major language groups, with more than 500 dialects. RELIGIONS Some 83% of Filipinos are Catholic. About 5% are Moslem. The rest are made up of smaller Christian denominations and Buddhist. UNIT OF MEASURE The Metric System is used in most trade and legal transactions. ELECTRICITY 220 volts a/c is the common standard. 110 volts a/c is also used, especially in major hotels. CURRENCY The Philippines’ monetary unit is the peso, divided into 100 centavos. Foreign currency may be exchanged at any hotels, most large department stores, banks, and authorized money changing shops accredited by the Central Bank of the Philippines. International credit cards such as Visa, Diners Club, Bank Americard, Master Card, and American Express are accepted in major establishments. lthough already celebrated by the local tribes people in Davao, the Kadayawan was only inaugurated as part of the city’s official calendar in 1986. Initially termed as “Apo Dwaling” (referring to the top three affiliations with the city: Mt. Apo, the Durian fruit and the Waling-waling flower), it was later renamed as Kadayawan from the Mandaya word “Madayaw,” which is a friendly greeting that refers to anything good and beautiful. The festival has always been a celebration of the harvest along with other blessings. Now, locals and tourists alike indulge in this time to savor the sweet yet punget Durian and dance to the beats of the tribal music. One of the festival highlights is the “Hiyas ng Kadayawan”pageant. Ten lovely young ladies represent each of the 10 indigenous tribes in Davao and compete for the title through tribal garbs and performances. The pageant is distinct for its emphasis on tribal culture and life. ROADTRIP Tips Long travels can somehow be exhausting and dull; it can sometimes make you feel impatient that you end up snoring at the back seat in the middle of an exciting trip (boo you! ).But not if you have travel buddies that make you feel comfy and relaxed. Consider these buddies that can make you feel the road seem a lil’ bit shorter: • Embrace comfort. Bring assorted sizes of pillows. There is nothing more comfy than having a fluffy pillow to hug whenever you feel like you want to doze off during the trip. • Let your feet breathe. Don’t be too harsh on your feet. Please bring yourself a good pair of slippers. During travel breaks, it’s nice to give your precious toes a room to breathe so it would feel more relaxed for the next few kilometers drive. • Music mate. Make sure to bring your mp3 player or ipod with you (with your favorite playlist) because it keeps you away from the monopoly of a potential long journey. And also, a trip is better off with a little stomping of the feet while singing along with your travel pals. • Comfort Food. Pack light and easyto-carry snacks like peanut butter sandwiches, granola bars and lots of chips to munch on. • Portable Games. To keep yourself active, do not forget to bring your Nintendo DS, PSP or Ipod Touch (or even your laptop) to supplement your gaming/surfing satisfaction during the trip. It’s always helpful to have a gadget that make the miles fly. Of course, not while driving, okay? WHO WILL BECOME THE NEWEST FACE ON GLEE? After weeks of elimination’s, we are down to the final four performers who each seek to be the newest face of hit musical drama Glee. Will it be the divalicious Alex, the sweet-faced Damian, the strong-willed Lindsay or the suave rocker Samuel? Only one can win The Glee Project and reach their dreams of instant superstardom. different backgrounds and brought with them different ideals and characters. Over 9 weeks they won over the hearts of viewers as they sang, danced and acted their hearts out trying to avoid elimination. Judging them each week were Glee creator Ryan Murphy, casting director Robert Ulrich and choreographer Zach Woodlee. So who has it in them to be the next Lea Michele or Cory Monteith? Watch the finale of The Glee Project first and exclusively on Jack TV and ETC and you will find out! The Glee Project finale premieres August 22 via satellite at 4PM with a primetime telecast at 8PM on Jack TV and ETC Jack TV is seen on Destiny Cable Channel 30, Cable Link Channel 57 and Sky Cable Channel 51. ETC is now seen on free TV on RPN-9. BUY YOUR TICKETS NOW FOR MANILA'S BIGGEST FOOD FEST!!! dining joints until the wee hours of midnight. Filipinos definitely love to eat with its limitless food varieties and innovative selections. You need not go out of town to enjoy regional dishes or delicacies. for sale at the ticket booths located at Manila Ocean Park. For details, please call 567-7777 loc. 155, 0917-8740667 (Sue), 0917-5852640 (edi) or visit www.manilaoceanpark.com. Presented by San Miguel Brewery Inc., Ginebra San Miguel, San Miguel Food Group, Inc., Tender Juicy Hotdog, Inasal Atbp, American Home, Viva Artists Agency, The Events Project, 106.7 Energy FM, Mellow Touch 94.7, News 92.3 FM, 103.5 Win Radio, Businessworld, Business Mirror, Manila Standard Today, B2BCarshow.com, Openrice.com, Spot.ph, Munchpunch. com, Herword.com, Woman Today, Celebrity Recipes and Flavors magazine. Also brought to you by Liquid Pool & Lounge, Sandbar Seafood & Grill, Makan Makan Asian Food Village, Quix and Zenyu Eco Spa. authentic traditional rituals and dances. and other stakeholders of the province. by the menfolks down to the beach. procession along the Naga River. ing different versions of angel costumes. CLARK, 15 AUGUST 2011 – AirAsia Philippines’ first aircraft arrived at the Diosdado Macapagal International Airport in Clark today. The brand new, state-of-the-art Airbus A320 commanded by Captain Johansen Hernandez carried 29 people, including Marianne Hontiveros, Chief Executive Officer of AirAsia Philippines; H.E. Mercedes Tuason, Philippine Ambassador to the Vatican; several Filipino media; as well as an all-Filipino crew. Ms. Hontiveros said, “This is a proud moment for AirAsia Philippines as the arrival of the new aircraft signifies our first step in introducing ourselves to the nation. As an archipelagic country, air travel is necessary for Filipinos and we are here to serve and help them stay or be better connected with their families and friends. “The Philippines has great potential in tourism, as our country has so much to offer. With AirAsia Philippines, we hope to increase the number of tourist arrivals. This is good for the community in Clark as well as Northern and Central Luzon as they can benefit in various areas including hospitality, retail and entertainment.” The aircraft, which landed at 11.30 a.m. from the Airbus factory in Toulouse, France, is the first among four aircraft that will be delivered to AirAsia Philippines in its first year of operation. While it taxied on the runway upon arrival, it was greeted with a water cannon salute. The second one is slated to arrive later this year and another two will be delivered in 2012. Among those on ground to witness the special event were Victor Jose I. Luciano, president and CEO of Clark International Airport Corporation; Felipe Antonio Remollo, president and CEO of Clark Development Corporation; and Hon. Alberto Lim, Secretary of the Department of Tourism. Currently, AirAsia Philippines is awaiting official approval to start flying commercially. The airline plans to use the first aircraft to fly to Singapore, Macau and Hong Kong, and the second one to ply routes to Bangkok (Thailand), Incheon (South Korea), Kalibo (near Boracay, Philippines) andPuerto Princesa (Palawan, Philippines). SEND US YOUR PHOTOS: We would like to publish your travel photos in the magazine. If these includes images of your friends and family, we may require you to send paperwork in order for us to publish your photos. For those photos to appear, we need either high resolution color scans (300 dpi) or you can send print copies of your photos. Please do not send originals, since we may not be able to return them to you. Email those photos to juanphilippines@gmail.com now! JUAN Philippines will revolutionize the Advertising Industry wherein you pay an ad placement that covers three mediums: Print, Web, Video through JUAN TV. Which will be broadcast through our website www.juanphilippines.com. Our website averages 300,000 hits per month since April 2009..
Just Us And No other Philippines. JUAN Philippines is happy to have paved the way for new free publications to spread how beautiful the Philippines is. Together Let's help the Philippines get the attention and recognition it truly deserves.